Byron Bay Australia is a very popular travel destination. A sleepy coastal township only 20 years ago, Byron Bay took off and developed into one of the most popular travel destinations in Australia. It's popular with surfers and famous for its excellent beaches, yoga classes and alternative therapies. 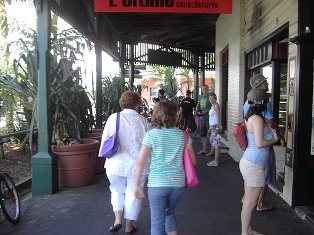 It's also got some great markets and restaurants, and the beautiful Byron Bay lighthouse. 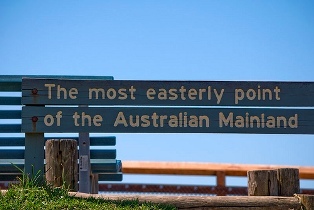 And - it's the easternmost point of Australia. Established in the 1890s, Byron Bay was a small coastal settlement of whalers, timber loggers, then banana and pineapple farmers, until in the 1970s it turned into an artists’ and hippie community, and in the 1980s it got famous for Hollywood celebrities who started to move in and build their huge mansions in the hinterland. Few travellers had bothered before to turn in to Byron from the highway, now everyone wanted to find out what was so special about the place. Tourists started to arrive, buildings started to rise and today Byron is a vibrant town with laid-back locals, backpackers and other travellers. Byron Bay’s town centre is in the blocks around Johnson Street. 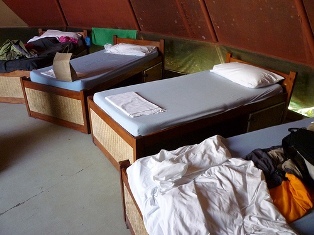 Here you find the surf schools and dive centres, travel agencies, tour operators, alternative therapies and shops, cafes, restaurants, bars and nightclubs. North of the town centre is Main Beach; west of it is Belongil Beach and right of it are Clarks Beach and The Pass. The Lighthouse. By AllPosters. Click on thumbnail to buy. 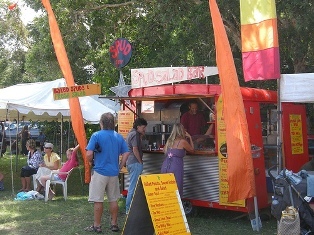 The amount of Byron Bay restaurants and eateries will not leave anyone hungry: there are the Boomerang Grill, Cyprus Tree, Dish, Driftwood Restaurant, Fig Tree Country Restaurant, Fishheads@Byron, Fresh, Great Northern Kitchen, Hogs Breath Cafe, Le Sirrocco, Olivo, Peppers, Piggery Restaurant, Raving Prawn Restaurant, Red Hot & Green, Sushi Wave, Thai Lucy and the Earh’n’Sea Amazing Pizza and Pasta Family Restaurant. The cafes, bars and nightclubs are also abundant. You can have a drink at the Beach Hotel, Cheeky Monkey’s or Railway Friendly Bar; go clubbing at C-Moog, La La Land or Cocomangas; and have a coffee at Artic Cafe, Belongil Beach Cafe, Cafe D.O.C., Cafe Spice, Caffe Raw, Espressohead, Harvest Cafe, Sails Cafe, The Pass cafe, Twisted Sista Cafe or The Big Blue Cafe. Other places include Byron Juice Bar, Byronian, Jack’s Place, Julian’s, Relish Byron, Macs Homestyle and Persephone’s Window. Kings Beach. Poster by AllPosters. Click on thumbnail to buy. And you can see the influence of flower power: even though the streets are crowded with backpackers and real hippies are almost invisible, modern Byron Bay still enjoys the alternative lifestyle with yoga classes and alternative therapies offered by Ambaji, Samadhi’s, Medicine Wheel, Relax Haven, Intouch Yoga and Massage, Yoga Arts and Yoga with Flo. East of the town centre is Cape Byron with Watergo’s Beach and Little Watergo’s Beach. As you enter the cape via the lighthouse road, on your left hand side is Captain Cook Lookout from which you can enter a bushwalking track that takes you all the way around the cape and to the lighthouse on the eastern side of cape. If you don’t want to walk, there are also a few drives on the Cape Byron that take you around and to the lighthouse. 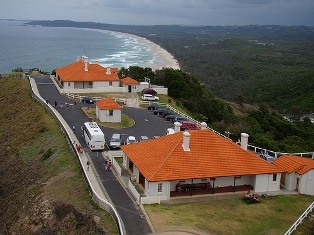 Cape Byron Lighthouse is just south of the easternmost point of Australian mainland. It is 22m high, was built in 1901 and was one of Australia’s most powerful lighthouses. There are some beautiful views across the water from here, and it’s an excellent place to watch dolphins in the water, or humpback whales passing by the coast on their yearly migration between August and October. The Pass, Watergo’s and Little Watergo’s beaches are Byron’s best surf beaches. Surfers. Poster by AllPosters. Click on thumbnail to buy. Further south along the eastern coast are Tallow Beach and Seven Mile Beach. Also south of town is the 98-ha Broken Head Nature Reserve – a remaining pocket of subtropical rainforest which once covered the whole area. There are bushwalking tracks through the forest and to King’s Beach which is popular with fishing. You can learn to surf in Byron Bay at East Coast Surf School, Blackdog Surfing, and A Real Surf Journey; kite-board with Byron Bay Kiteboarding and you can abseil, cave and mountain-bike with Rockhoppers, Peterpan Adventures and Wicked Travel. 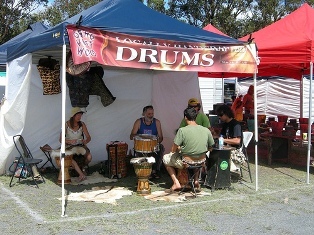 The first Sunday every month there are the Byron Bay Markets, a lovely place to go shopping, getting a massage or just strolling around amongst tourists and backpackers. Here's a Byron Bay map, where I have tagged the places mentioned on this web page. You can click on the tags to see what places they are, and double-click anywhere on the map to zoom it in and see the places closer. Drag the map to move around, and if you want to see the satellite image with Google Earth, click on "Sat" in the top right hand corner.